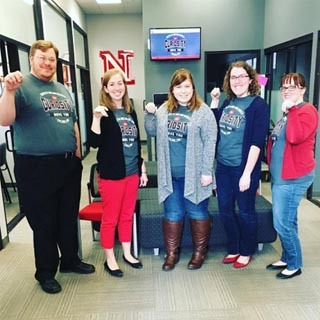 This past week our advising center presented our spring career development workshop, “Sprinkling on Some Experience.” We were inspired by our college motto (Academics + Experience = Opportunities) and the recent meme “Saltbae.” Our college motto of Academics + Experience = Opportunities is something that our students hear from recruitment, to their freshmen enrollment date, and throughout their academic and career advising. We strongly believe as a college that for success you need to have both pieces of the equation – the academics in the classroom, as well as the experiences you gain out of the classroom. With this equation our college promotes five specific experiences and we hope each student engages in at least one – Education Abroad, Student Involvement, Civic Engagement/Volunteerism, Part-Time Jobs/Internships, and Research. For this workshop we invited professional staff from all five experience areas, as well as current students in our three main disciplines (natural sciences, social sciences and humanities) to discuss the opportunities their office provides as well as the students’ experiences. Our hope was for students to come and learn how to “sprinkle some experience” into their college career. Of course we drew students in with food (pizza), and our marketing materials had “Saltbae” sprinkling pizza toppings to get the message across. Originally after introductions from each area, we were going to have students break out into groups and visit all five experience areas. Due to the number of students (about 20-25, more than we expected), instead we had them mingle around the room in a less formal setup. However, this caused some offices/areas to get more traffic (Education Abroad and Research), while others hardly got any visitors (Student Involvement). With the feedback we received both from students attending, and students presenting, we should go back to our original idea – and get a bigger room. By the end of the night we were pleased with our turnout, with the conversations we were hearing, as well as the few leftovers we had. Overall we were very pleased with our workshop and hope to improve and tweak it for the future!